The Magento platform, released in 2007, has not only changed the entire e-commerce sphere, but also occupied leading positions on the market. So, why this CMS is a choice of hundred of thousands entrepreneurs around the globe? The history of Magento is a success story of how a small IT company in just a couple of years has become №1 in Open Source segment of e-commerce solutions. 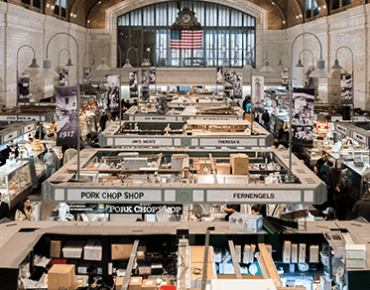 Intellect, creativity and hard work of the young professionals made this success possible. This story begins in 2001, when young student from the US Roy Rubin began to work in the Internet, doing installation and automatization of online stores. Couple months later, he founded the company Varien Inc., which was renamed to Magento in 2010. Just few years later Magento was recognized as one of the leading companies providing services for design and development of online stores based on osCommerce (“Open Source Commerce”). Combination of PHP and MySQL was chosen as development technologies. A real breakthrough happened to the company in 2006, with decision to create its own platform for building online stores – Magento Commerce. At approximately the same time, Magento established an office in Ukraine and this way doubled the total number of employees. It was Ukrainian office that turned into the main force, where the complete development process was taking place itself – from the moment of obtaining specifications of the project to its testing and publication. Magento is an internationally acknowledged product that Ukrainian developers can be fairly proud of today. The dynamics of the company’s growth is impressive – in the next 5 years, the number of employees increased from 3 to 250. Without any doubts, 2011 was very successful for Magento – it has demonstrated constant growth since its creation and without signs of slowing down. After acquiring by eBay and integration into X.commerce system, its popularity has grown in several times. Many companies began to use the platform, bringing it this way to the leading positions on the international market. If you only have an idea to create your e-commerce website or already have a brick-and-mortar business which you want to transfer into online, Whidegroup’s qualified IT-specialists are ready to help you. It may seem rather difficult to find a remote development team with skills that perfectly match your company’s goals and needs, but give a try to work with Ukrainian specialists and make sure they are a good fit for you. Whidegroup is ready for establishing of professional relationship with companies from the EU, USA, Canada, Australia, UK, and all over the world. Today, users are searching the word “Magento” in Google search engine more often than the “e-commerce”. The main mission of this software is achieving everyone’s prosperous activity in the world of e-commerce, and company’s goal is to be a part of the result. Consequently, 250,000 Internet projects with a total turnover of more than $50 billion per year are built on Magento, which makes it optimal CMS for online stores with a double advantage comparing to the closest competitors in amount of installations. More than a million functional websites are created on Magento now. Development of the platform is supported by an extensive network of partners, an active development community and a huge number of additional modules and themes are available on the Magento Marketplace. Thus, Magento is leading among other platforms with 25.1% of the total market. At the same time, 4% of sites use the multifunctional Magento Enterprise Edition, which means that the number of large corporations that choose Magento increases. 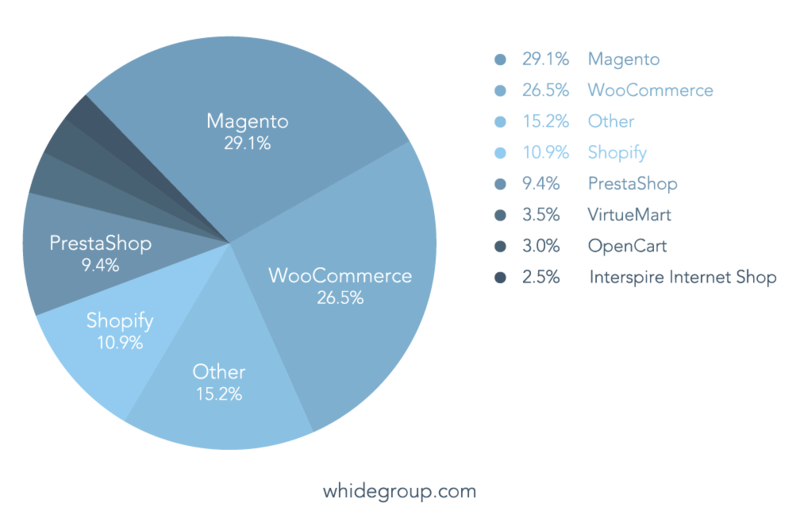 Competing platform WooCommerce follows very closely and has 26.5%. It can be explained with the fact, that WooCommerce is easy and simple to implement, since it doesn’t require such professional development skills as Magento does. However, with Magento you have more extended range of variations how it is possible to customize and upgrade your e-commerce website to make it more solid. So, Magento still wins, due to all the advantages over the others that guarantees stable leadership for a long time. The third and fourth places went to Shopify and Prestashop with 10.9% and 9.4% accordingly. These four ones take three fourth of the market. At the moment, Magento confidently maintains its leadership. Business giants like 20th Century Fox, Gap, Lenovo, Longines, Nestle Nespresso, Nokia, Olympus, Samsung, Skype and Time Out made their online stores on this platform. 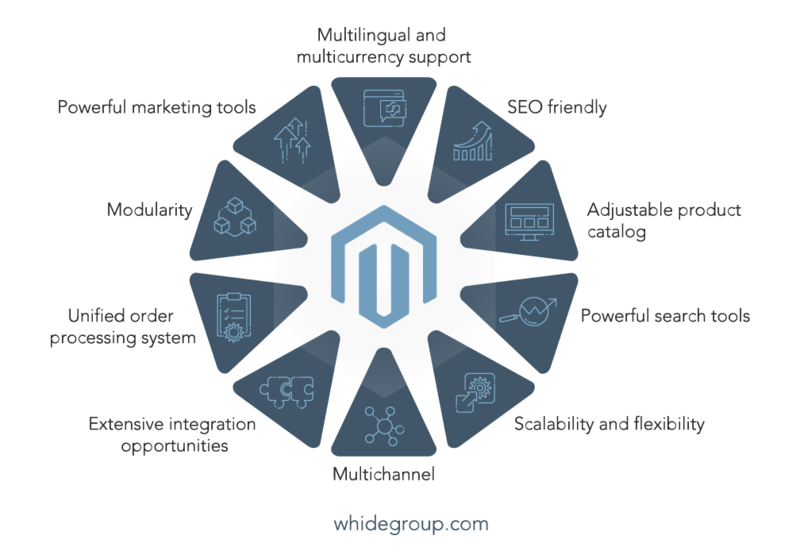 Therefore, if top-companies choose Magento, maybe it’s time for you to choose it with Whidegroup? Our company specializes in e-commerce consulting, web and mobile development, UI/UX design and support services. Leading position of Magento is facilitated by its high flexibility and manageability as well as by the absolute absence of necessity of long and messy work with code. This makes it possible to provide buyers with maximum convenience and minimal time and money expenses. Among other benefits of Magento for e-commerce website development is its reliability – Magento supports PCI DSS, a security standard for the payment card industry, which is very important for stores that have to deal with credit cards’ data. 1. Powerful marketing tools. Magento allows to increase customer interest, stimulate repeated sales and encourage regular customers, systematically and effectively increasing their loan-to-value (LTV). 2. Multilingual and multicurrency support. An unlimited number of online stores’ types for different markets is supported in following ways: multilingualism, support for multiple currencies and taxation systems. Likewise, it is possible to maintain warehouse and management accounting in one currency and display them on the site in another (including at the buyer’s option). Also, you can assign different currencies for pricelists of different showcases and manage the exchange rates (manually and automatically with an updating according to the schedule), as well as work with tax rates at the level of the region, country or postal code, which depends on the type of sale (e.g., wholesale or retail sales, can be taxed in different ways) and goods (for example, “tax on medical equipment”). 3. SEO friendly. Magento is configured for best indexing and ranking process of search engines. Convenient SEO allows to have the full control over HTML markup, setting an individual HTML template for a particular product or commodity section is also possible. You can set custom parameters of search optimization for each page (product, section or text section), which allows you to specify a separate URL-address for each item and its section. Sitemap in XML format is created automatically, which is necessary for search engine robots. 4. Adjustable product catalog. Magento is suitable for stores with any assortment: household appliances and electronics, fashion, food retail, kids’ stuff, etc. Flexible catalog is ready for sale of different types of goods: simple, configurable, digital, in sets and kits. The ability to specify various attributes (properties) for goods, grouping the goods into sets, configurable products – products with selective properties (for example, color and size for clothes, the amount of memory for electronics, etc.) Availability of wishlist, shopping cart and ordering, personal cabinets of buyers, buyers’ recommendations for goods, suggestions of related products (cross-sales). 5. Powerful search tools. Search and navigation instruments are aimed to help the client quickly find the right products in online store. 6. Scalability and Flexibility. Projects on the Magento platform are capable to withstand high loads: the influx of visitors during stocks and sales, a large number of orders, constant users’ activity. Sites work fast, so they are better ranked in search engines. 7. Multichannel. Nowadays, buyers require integrated presence of retailer on all sales stages and appreciates this. Magento supports all the main scenarios of multichannel interactions of a buyer with store, providing up-to-date information and qualified services on all available channels. 8. Extensive integration opportunities. The platform is a leader among ready-made integrations with e-commerce services. This allows to provide customers with a convenient and recognisable service, a variety of payment and delivery methods since launching of online store. 9. Unified order processing system. The order management system (OMS) allows customer to fully control processing of their order in any interaction channel, make changes and perform returns easily and conveniently. 10. Modularity. The system is initially designed for a modular architecture, the core consists of several modules and can be easily extended with third-party plug-ins (paid and free) which you may found on the vendor’s website. 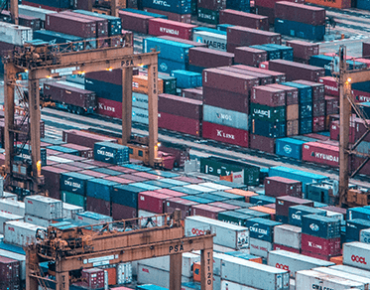 Also, there is a possibility to import and export data – Magento DataFlow is an object-oriented library that allows the programmer to write their own import and export modules. All these advantages of using Magento for e-commerce development explain the high influx of customers into stores based on it. The platform continues to strengthen its leadership on the e-commerce market, so next year is likely to be even more successful for Magento. – Advanced support and maintenance. Altogether, it is worth to note that this platform really stands out among the others. First of all, it’s due to its ease of use, huge functionality and constant support. Also, it provides you with powerful marketing and SEO optimization tools, multilingual and multicurrency support, flexibility, scalability, wide opportunities for integration, a huge number of additional modules and a lot of other awesome features. And all this is available to you even in the free Open Source version – that’s the answer why use Magento for e-commerce. Magento is a good solution for your online store, which has been proven by representatives of both small-, medium-sized businesses and even world’s top companies. Build the ultimate Magento experience with IT-professionals from Ukraine.